Small hunting spider (around 8 mm) with a big appetite, which catched a large fly. The picture has been made with magnification factor 5 and f/13. 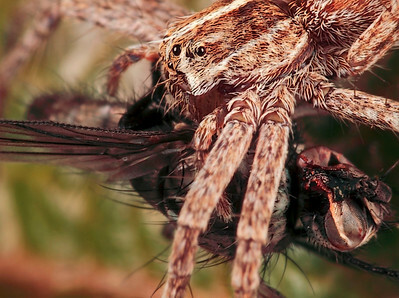 Spiders (order Araneae) are air-breathing arthropods that have eight legs, and chelicerae with fangs that inject venom. They are the largest order of arachnids and rank seventh in total species diversity among all other groups of organisms. Spiders are found worldwide on every continent except for Antarctica, and have become established in nearly every habitat with the exception of air and sea colonization. As of 2008, approximately 40,000 spider species, and 109 families have been recorded by taxonomists; however, there has been confusion within the scientific community as to how all these families should be classified, as evidenced by the over 20 different classifications that have been proposed since 1900. Portrait of a large hunting spider. The picture has been made with magnification factor 6 and f/11. 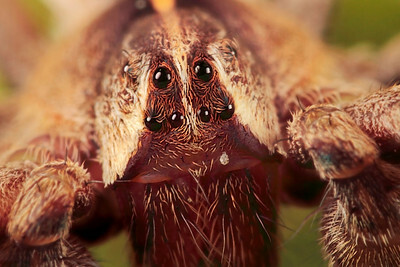 Spiders (order Araneae) are air-breathing arthropods that have eight legs, and chelicerae with fangs that inject venom. They are the largest order of arachnids and rank seventh in total species diversity among all other groups of organisms. Spiders are found worldwide on every continent except for Antarctica, and have become established in nearly every habitat with the exception of air and sea colonization. As of 2008, approximately 40,000 spider species, and 109 families have been recorded by taxonomists; however, there has been confusion within the scientific community as to how all these families should be classified, as evidenced by the over 20 different classifications that have been proposed since 1900 (source: Wikipedia). Portrait small crab spider, made with magnification 10 and f/6.4 using a Canon 7D, a Canon MP-E 65 mm/f2.8 and a Canon 2x teleconverter. Crab spider is a common name applied loosely to many species of spiders, but most nearly consistently to members of the family Thomisidae. 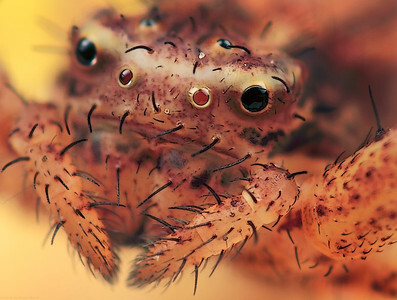 Among the Thomisidae it refers most often to the familiar species of "flower crab spiders", though not all members of the family are limited to ambush hunting in flowers. None of the crab spiders build webs to trap prey, though all of them produce silk for drop lines and sundry reproductive purposes; some are wandering hunters and the most widely known are are ambush predators. Some species sit on or beside flowers or fruit, where they grab visiting insects (source: Wikipedia). Portrait small crab spider, made with magnification 8 and f/8 using a Canon 7D, a Canon MP-E 65 mm/f2.8 and a Canon 2x teleconverter. Crab spider is a common name applied loosely to many species of spiders, but most nearly consistently to members of the family Thomisidae. 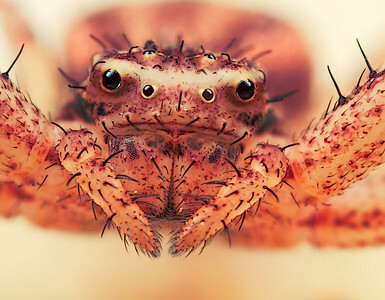 Among the Thomisidae it refers most often to the familiar species of "flower crab spiders", though not all members of the family are limited to ambush hunting in flowers. None of the crab spiders build webs to trap prey, though all of them produce silk for drop lines and sundry reproductive purposes; some are wandering hunters and the most widely known are are ambush predators. Some species sit on or beside flowers or fruit, where they grab visiting insects (source: Wikipedia). 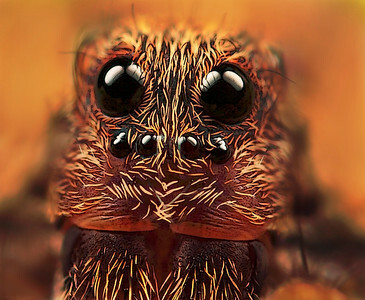 Frontal portrait wolf spider, made with magnification 10, f/6.4, ISO 100 and 1/250 sec. using a Canon 7D, a Canon MP-E 65 mm f/2.8 and a Canon 2x teleconverter. Wolf spiders are members of the family Lycosidae, from the Ancient Greek word "λύκος" meaning "wolf". They are robust and agile hunters with excellent eyesight. They live mostly solitary lives and hunt alone. Some are opportunistic hunters pouncing upon prey as they find it or even chasing it over short distances. Some will wait for passing prey in or near the mouth of a burrow (source: Wikipedia).